Ossetian pie is made with all kinds of stuffing — cheese, potatoes, or mushrooms. This must be number one in your list! Cucumbers, cabbage and carrots — these are the main vegetables that locals pickle and salt in a special way. Sometimes they are all left in one glass jar on purpose — this is why both the cucumbers and cabbage turn into an intense pink color and get a really nice smell. Another salted dish is tursha. Tursha is ordinary green beans which have been salted in accordance with a local recipe. Tursha can be either green or yellow, depending on the variety and the time when the beans are collected. Sochi locals salt not only the vegetables, which they typically have grown themselves, but also the wild ones they have collected in the woods. When spring comes they collect young shoots of local bur which run around trees and slightly resemble a vine. In addition, locals salt succulent stems of burdock leaves. The harvest of this type of plant can also be pickled, soured and salted. The bur actually tastes a little bit like a pickled eastern fern, and as for the burdock — it has a really distinctive taste — like nothing else! If you ever see these local delicacies — don't be afraid! Definitely try this "wild crop." There are many recipes and as many ways of serving this dish, but you can eat it any way you like — as a separate meal or an appetizer, hot or cold. The main ingredients of any variant of ajapsandal are eggplants, tomatoes and sweet Bulgarian pepper. Some add a bit of carrot, others add potatoes. Sometimes even a little bit of meat is added. A chef from a Sochi restaurant advised me to cook ajapsandal this way — I slightly grill the eggplants and peppers. Then I take the skin off of the vegetables and cut them into small pieces. After that I also take the skin off the scalded tomatoes, slice them and add hot red pepper. The next step is to chop up some garden onion, green onion, add some fennel, parsley and cilantro. I finish by adding a tiny bit of sweet purple basil — without it, ajapsandal simply won't taste right. The result is a delicious warm Caucasian salad. In the Caucasian region, practically everybody loves eggplants. You can find them in the menu of any restaurant. During the summer they usually are either baked or grilled, and in the winter — salted. If you are exceptionally lucky, in February or March you will be offered to try a grilled eggplant roll — don't decline the offer! The stuffing of the rolls differs, but usually they are made of walnuts, garlic and Caucasian herbs. 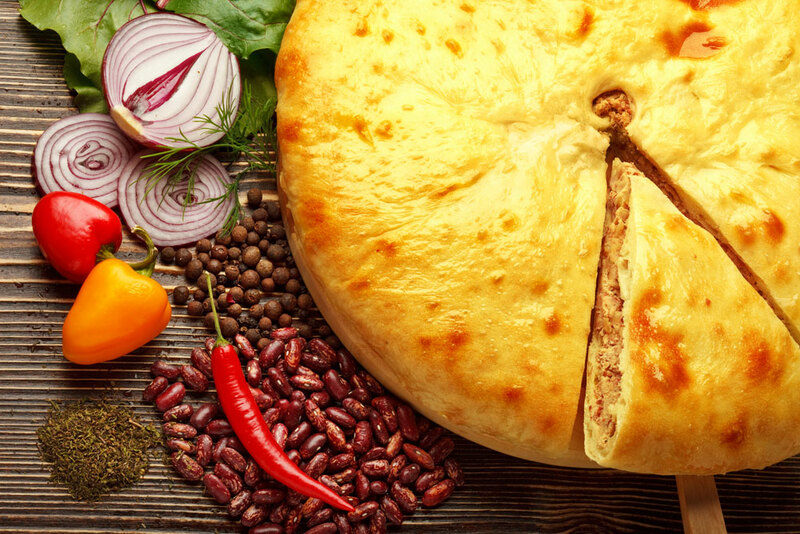 If you've decided to have lunch in a cafe with national cuisine, check if they have Ossetian pie on their menu. It's made with all kinds of stuffing — cheese, potatoes, or mushrooms. We highly recommend trying the whole variety, because each one has a taste like no other. However, you should be on the lookout for Ossetian pie with beet tops. This is a really rare stuffing, even in Sochi. Mamaliga is a special kind of porridge. It is usually cooked in western Ukraine and in Moldova. Depending on the recipe and on the flavor, it can look completely different each time it is prepared. It is made out of either maize grits or flour, cooked on milk or water, with dairy butter or vegetable oil. The color of the porridge changes from bright yellow to white depending on the grind of the maize. Mamaliga "came" to Sochi all the way from Abkhazia. There it is often eaten instead of bread — as an addition to meat or vegetables or as a separate meal together with herbs and cheese. Try some mamaliga in different places — you'll see that the taste will vary each time! Vareniki can be made with any kind of stuffing you like. Source: Lori / Legion-MediaVareniki are vegetarian pelmeni. The filling is put on a thin circle of unfermented dough, and then the dough is patched in the form of a half-moon to hold the filling. After that these "patched" vareniki are thrown into boiling water for a total of five minutes. Russians love this dish almost as much as they love pelmeni. The stuffing may vary — Russians like their vareniki with potatoes and mushrooms, with cottage-cheese and with cherries. But actually vareniki can be made with whatever you like. Depending on their stuffing, whether it is salty or sweet, vareniki can be regarded as a square meal or as dessert. Both the salty vareniki and the sweet ones are usually served with sour cream. If the vareniki are made at home, then a small button or a spoon of salt are sometimes put inside of one or two vareniki. The person who gets this surprise will have their wish granted!